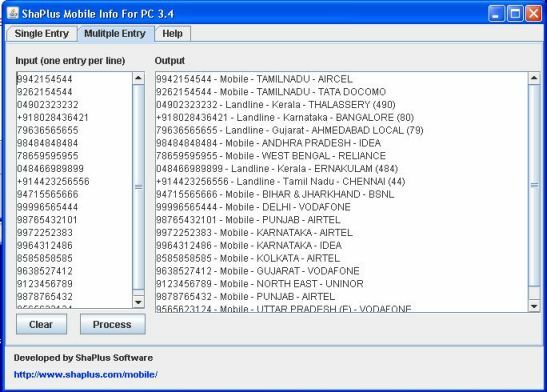 This is a freeware to find the location (Region/state) and cellular operator of any given Mobile number(Indian numbers only). Mobile number can be either entered (first 5 digits) or can be selected from the mobile's contacts list. Android and Java phone can also lookup all Indian STD Codes. 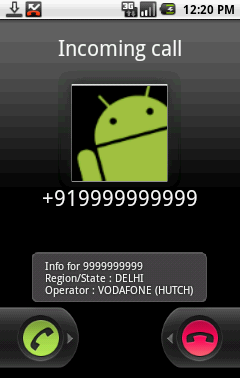 In Android version, on Incoming and outgoing calls, an alert is displayed to show the location of call. This is an offline application, no need of internet connection(GPRS) to function. Different versions are available for Windows, Java supported mobile phones and android phones. When you receive a missed call, find out from where you got the call. So before calling back you can know it is STD or local. Some operators charge less when calling to same network. So before making a call find out if it is same network or not. Q: Why was ShaPlus Caller Info removed from Google Play Store ? A: Recently Google Play store introduced a new policy in which apps could not use permission that allowed viewing of users call logs details unless it is part of applications core function. In ShaPlus Caller Info, there is call log section in which each entry is shown with their location and it required this permission. As call log is not core function of this app, play store removed this app from Google Play Store. Q: Now Mobile number portability (MNP) has been launched in India, so will this software work as before ? A : Only the location will be correct and operator displayed will not be right for numbers ported using MNP. Q: When I entered 9xxx, it is displayed as "Not Available". Why is it so ? A : New series of numbers are allotted regularly and the number you checked is a newer series number not included in this tool. We will try to update this tool when we get information regarding this. Please let us know if you do not find any series. Q: Can I know the name and address of the owner of a given mobile number with this tool? A : No, it is just a lookup tool to identify the region and operator based on the starting few numbers of the mobile. Q: Will the region be correct when the person is Roaming ? A : Again No, It will just display the region where this Mobile number is allotted.